Stonger, Lighter, More Compact. Easily the lowest vibration machine in its class with a staggering 40% reduction in vibration. The Stihl M-Tronic controlled electronic injection ensures straight forward operation that is smooth running.The TS500i also has electronic water supply metering. Together with the anti vibration system helps you to achieve a very exact cut. 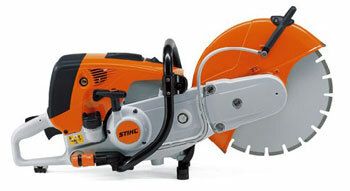 Handles like a chainsaw with the power of a cut off machine. 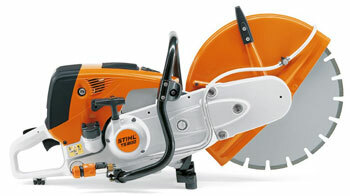 With side mounted chain tensioning, STIHL anti-vibration system, water connection, decompression valve, STIHL ElastoStart, water resistant starter cord. HD2 filter and standard fillable Bayonet fuel cap.The Stihl GS461 features a Diamond cut off chain for wet cutting and has pre sharpened diamond segments for top performance from the very first cut. The structure of the chain, with humped drive links, ensures quiet, low vibration operation. The guide bar also features water channels for washing and cooling the chain, chain track and sprocket nose. This ensures long service life of the bar and chain while also minimising the production of dust. 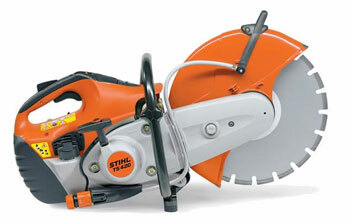 STIHL's most powerful cut-off saw ever. Intelligently designed for both manual or cart-based operation, it has a state-of-the-art low emission engine and anti-vibration system. Users will value the smart controls and easy starting features. 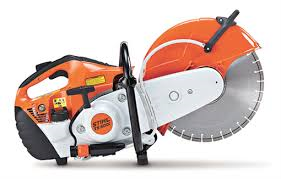 Cut-Off Saws are indespensable for cutting steel, concrete, rock, ductile cast pipes, asphalt or similar materials. Whether used for civil engineering, building or road construction, for emergency rescue services, gardening or landscaping.